Somewhere between the classics and rap, is Baba Brinkman’s raw performance art, “The Canterbury Tales Remixed”. Not your school days’ version of Chaucer’s verse and other epic tales, these new hip-hop rhymes changed the way I think about English literature. The show premiered in New York City at the Soho Playhouse. 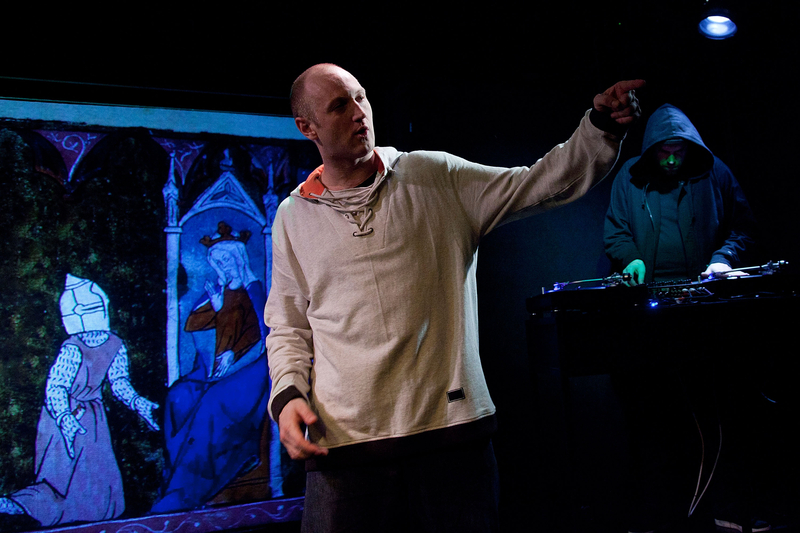 Now, Baba Brinkman is bringing The Canterbury Tales Remixed back to New York as a 3 show cycle of rap theater, off-Broadway. I can’t wait to see it, and asked Baba Brinkman a few questions about how he arrived at this fascinating place remixing classics. Did your passion for literature or rap come first? I was an avid reader before I was a rap fan, so I guess my passion for storytelling came first, and once I recognized rap as a potent medium for telling stories, the two passions merged. Where does rap fit in storytelling today? Rap began as a megaphone for the disadvantaged, and also as a window into the minds and experiences of urban African Americans and Latinos, whose stories weren’t being told. Today it is accepted as a viable art form for all races and cultures to tell their stories, a truly global phenomenon. Of course, if you’re not disadvantaged it can be more difficult to make your story interesting, because it lacks danger. Maybe that’s why I turned to Chaucer’s stories instead. Do you think of yourself as a poet or a performer? Poets were performers by nature until fairly recently, and as a medievalist I don’t accept the distinction. If poets want to only publish and never entertain an audience that’s their prerogative. It sounds boring to me. What are the gems you treasure in English literature, that are relevant to our world today? Besides Chaucer, both Shakespeare and Oscar Wilde are high on my list. How does your live performance compare with print versions of Chaucer’s Canterbury Tales? Comedic timing and voice inflection bring you into the story in way that words on a page never will. The difference can be measured both in comprehension of narrative subtleties and also laughs. Where can we find your work and see you perform The Canterbury Tales Remixed live? Thank you so much Baba Brinkman for sharing your passion for storytelling with rap performance art. This was quite interesting! I’ll definitely keep my eye out for Baba Brinkman.